Food coloring powders are a great way to alter the appearance of food without affecting the taste. They work well with foods that are not meant to be mixed with water. While dying food is easy, achieving a desired color with the powders may take some trial and error. The powders are highly concentrated; use them sparingly. Use them in the most natural light possible to achieve the truest color representation. 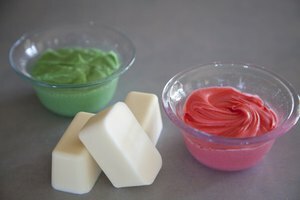 After the color is mixed with food such as icing, let the mixture sit for a few minutes prior to use for the color to darken fully. Open the shades on windows to let natural light into the workspace. Fluorescent lighting alters the shade of colors; working in as much natural daylight as possible will make achieving a desired color shade easier. Spoon the icing into a bowl. 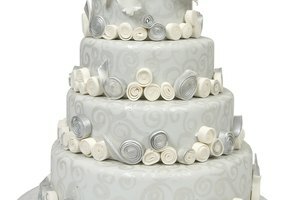 Sprinkle a little food coloring powder on top of the icing and stir. Allow the colored icing to sit for five minutes. The color will fully develop in this time. If you need a darker color, sprinkle a little more powder into the bowl and stir. Allow the color to develop again before deciding if the color is right or not. Repeat if desired. Set up in a naturally lit workspace. Pour some lemon extract or drinking alcohol into a bowl. Sprinkle some food coloring powder in with the liquid and stir. Allow the colored liquid to sit for five minutes. The color will fully develop in this time. Sprinkle a little more powder into the bowl and stir if you want a darker shade. Allow the color to develop again before deciding if the color is right or not. Repeat if desired. Dip a food-grade brush in the colored liquid to apply to food. Add the food coloring powder to sugar or other dry ingredients. Stir the powder and other dry ingredients together. Use this mixture for dusting food as you would use granulated sugar, coconut flakes and other dry products. Powdered food colors do not mix with water.